When we went down to the Scottish Parliament to give evidence to the RACCE committee it was in support of a petition put forward by Torridon Nephrops Management Group to try to get government to legislate on a gentlemen’s agreement which was slowly unravelling. That is to cap effort within a creel only zone and also to extend the zone so as to relieve some of the “honey pot” effect of even more creels coming into a limited area. The Committee has decided to keep the petition open for more discussion, research and views which has to been seen as a positive move in that they have not closed it down or dismissed it. This along with creel numbers linked to spatial management does seem to shine a little light on our declining fishery. Got an email at the end of last week giving me the details of a hake long-line and where they used to fish in the 60s. Maybe just maybe this will be the future again and open up anew but better controlled industry of sea angling and supplying west coast hotels with west coast fish. This would have the added benefit of relieving pressure on the langoustine stocks. 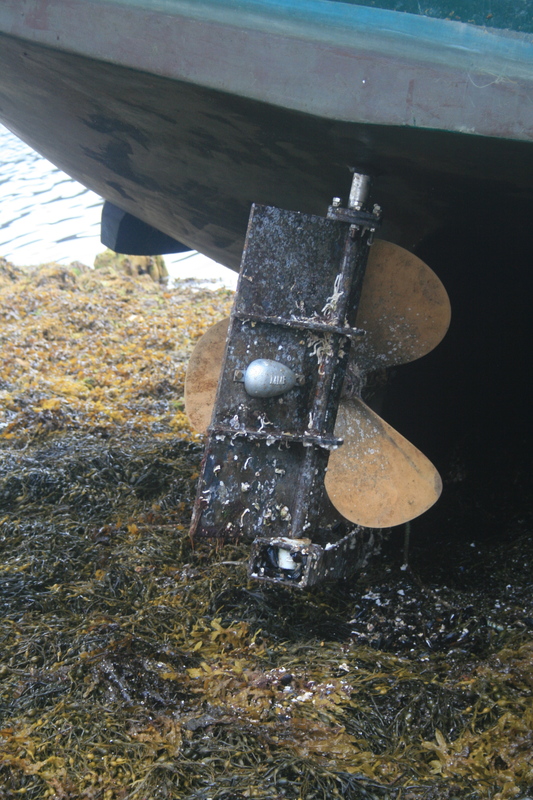 Marine Scotland, our civil servant overlord, has conducted a survey and there is a desire to cap limits on creel numbers but not to see their livelihood towed away by the mobile sector. In the MS response to the petition they have stated that they have commissioned an independent review of inshore fisheries management and creel only zones will be part of this and will be reporting in October. 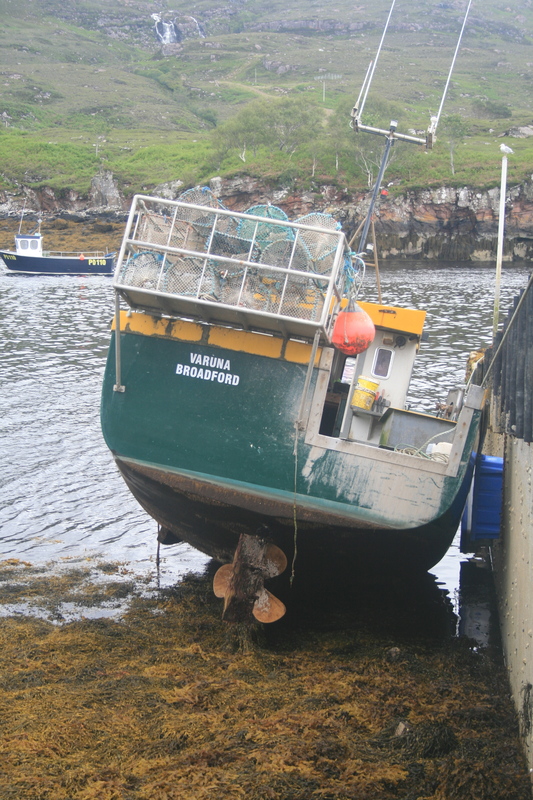 Mid morning the Varuna came alongside for a wash and anode replacement. Generally it is pretty clean as I had it copper bottomed by Stevie and Fred at the Kishorn Yard, three years ago now. 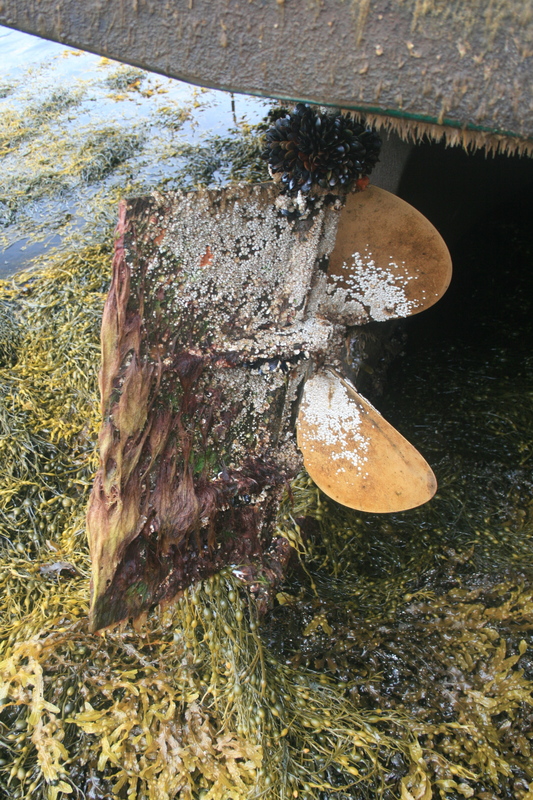 There is a bit of moss/grass growth but no mussels or barnacles, only on the propeller and keel which is probably the knot of speed I was losing. Great benefit is I do not have to anti foul so it is just a matter of waiting for the tide and away we go. A pleasant hour and a half spent in the garden weeding and seeding some more carrots, lettuce, rocket and lettuce. 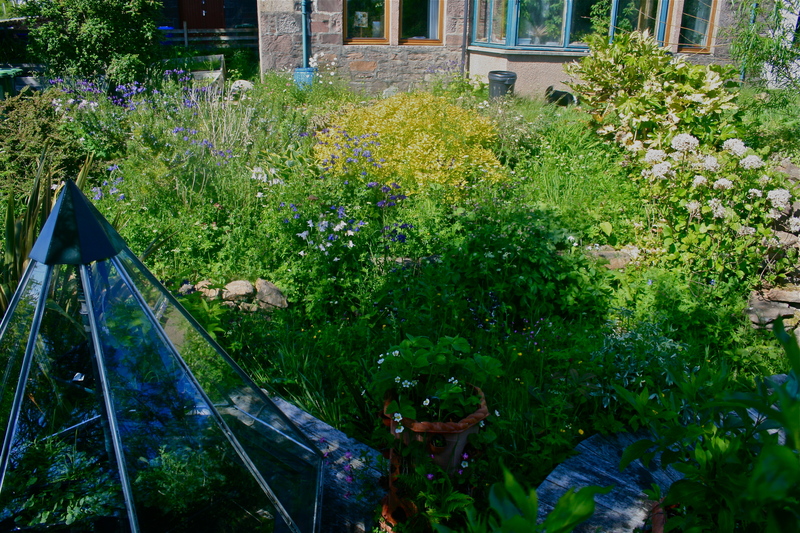 Garden looking nice and wild, a few bumble bee clinging on to the ox eyes and aquilegia probably done in by yesterdays poor weather. 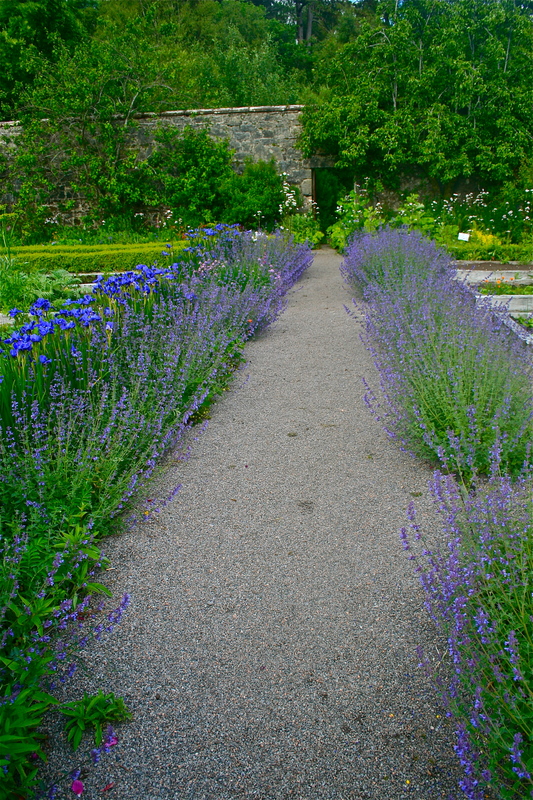 This evening and most days it is noisy with bees and feels great. It certainly is not a suburban one and would probably be told off for taking the value of the neighbours property down! 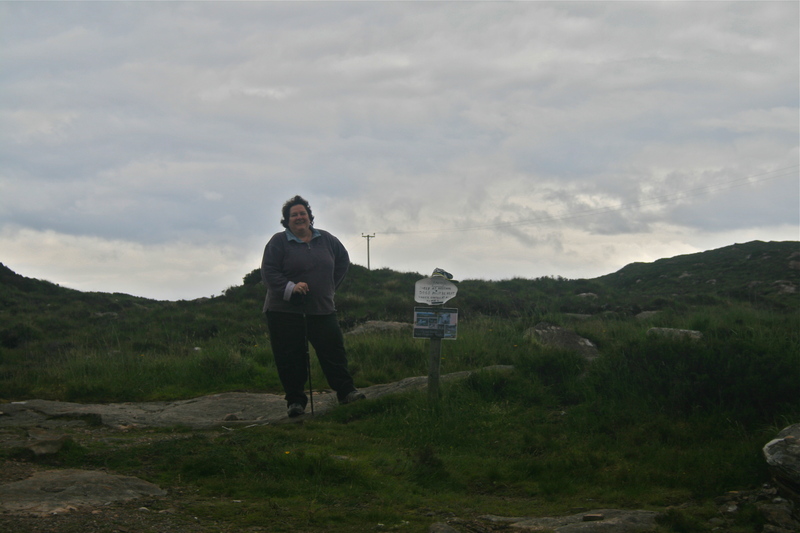 Passed Judith in her mountain gear heading for Ardban with Robert and brother, Chris…recovery continues. 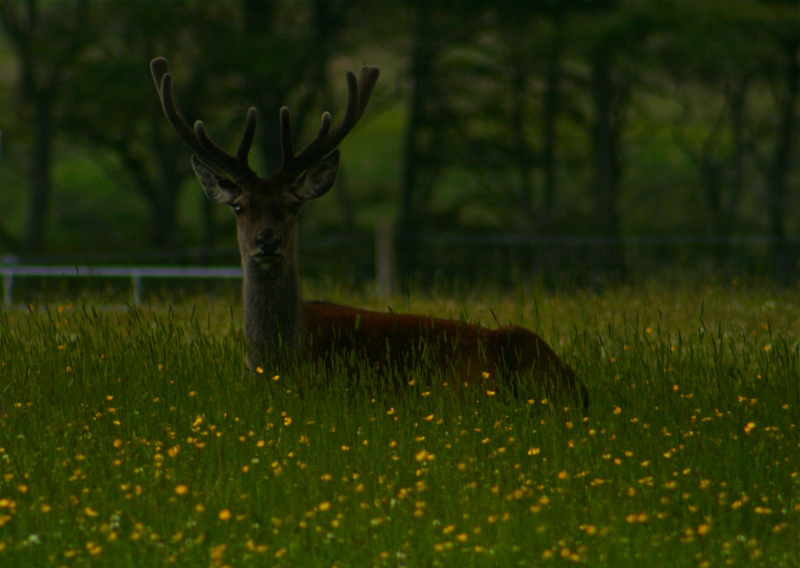 and fine sets of antlers were on display in the field by the Big House drive. Full on day despite not fishing or at the Inn. Three days in the life. Was going to post last night as a wind down from a shift at the pub but as it turned out I crashed about 20 mins after coming home. Busy last few days with a pub shift on thursday evening followed by a fishing day on Friday and another shift last night. The M.O.D. are still up doing trials on the range and I had the Merlin helicopter fly over me a few times on Friday. Although fishermen are not the navy’s best friends we co-exist quite happily. I really do not understand the logic of nuclear submarines, especially the bit about spending huge amounts of money on something you cannot use, I enjoy the unintended consequences of a better fishing around the range. This is basically an MPA (marine protected area) which most fishermen are against. There is an area where there are 17 hydrophones set up on the seabed with cables running from them to the Sand building where the operations are directed. This is closed off to all types of fishing with a surrounding no trawl area and the fishing does appear to be a bit better although it is still too heavily fished. It was a difficult day fishing but we did catch a few prawns despite a hydraulic pipe burst and a seized connection. I had to go into a bit of shelter to free it before carrying on hauling. Good result in that Hamish got his squats in sweet chilli sauce. I get far more pleasure seeing the seafood caught off Applecross and eaten locally. Although sometimes you get more money sending your products round the world I do not think this is sustainable in our unbalanced carbon world. Good shift to work last night, Kenny and Dave were on the cookers last night and the food, as ever, was spectacular. There is food being served at the Inn for pub food prices where, if you were in Edinburgh for example, you would be paying double for less. The competition was the theme of the night as a group of five turned up looking for accommodation. The Inn was full but they went to the campsite and booked one of the cabins. When they came back down for something to eat I picked up on an accent and told them about the staff competition where we have guessed how many countries come to the Inn over the year. To cut to the chase it turned out that Uruguay, Japan, Latvia, Poland, and Israel were the make up of the group. It is quite amazing that in the beginning of March there have been people from 22 different countries already visited. While walking the Dougal family yesterday morning you look around and see so much unused potential for people to live and work here. Before I came out I was emailed George Mombiot’s take on the Gamekeeper’s report on employment and sundries connected to the red deer of Scotland. He points out that in the whole county of Sutherland there are only 112 people employed with an income generated of 1.6 million pounds. He suggests it is difficult to find such an under used land mass anywhere else in the world. I have always believed that mono-cultures are really bad for a diverse environment and we seem to be surrounded by them whether it be sheep or deer overgrazing on land or the prawn trawling industry at sea. On land the bio-diversity has already disappeared where even the peat bogs are being degraded. There are signs this may be changing but it has to change with the people in mind. It does not have to be an either or. After living properly we are a part of the environment. Some institutions tend to forget this. We receive a regular email on Fridays from Laurence who is part of Senscot. He is working in a very optimist field, that of social enterprise, but holds a pessimistic view on life. He basically views the system we live in as broken and he often wonders what will emerge. Opinions are just that but I tend to agree with him and that is why working with The Community Company is so fulfilling. I think this is the way ahead to arrest the decline of the past few decades, at least locally. A vibrant community is the answer to many of our day-to-day difficulties.